Starting your new life in Thailand brings many considerations. One important consideration is your children and their education now or in the future. 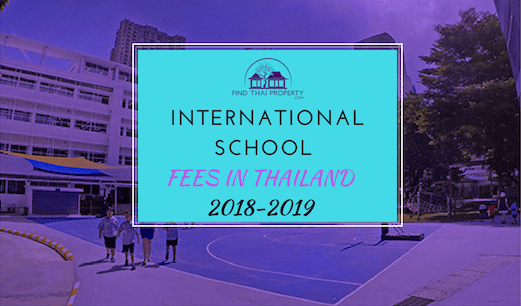 We’ve investigated the costs of some of the popular international schools in Bangkok and other factors that may help you decide where to educate your children. We would strongly advise you to consider private education in Thailand if your budget allows. Governmental education in Thailand is adequate, but some standards are still sub-par such as math and reading levels. Moreover, general conditions within Thai schools are in need of an overhaul. For example, a UNESCO GEM report in 2017 showed that only 45% of schools in Thailand have basic sanitation facilities and 60% had access to drinking water. Would you want your child subject to those conditions? In this article, we look at the cost of private education and its benefits. Furthermore, we provide a handful of examples of high-quality schools in Thailand for your information. As you can see the education system is broken down into 5 different stages. It is important to note that from the ages of 7 to 15, education is not compulsory. This is reflected in the fact that only 85% of children complete lower-secondary education. Tuition fees for universities can vary greatly. Public universities are cheaper, but there could be hidden expenses such as textbooks and admin fees. Typically, public university fees range between 15,000 to 300,000 THB per semester. Private Thai universities usually charge per credit hour with fees ranging between 2,500 to 4,500 baht. This is truly what you can expect to pay for private education in Thailand. To place a total figure per year we would approximate $25,000 per child. This would not include estimated initial compulsory fees of $15,000 (some of this would be refundable i.e. the development fee). For these figures, your children will gain a fantastic education via internationally renowned educational establishments. The cost may look steep, but the general cost of living in Thailand is much cheaper than in the western world so the overall cost of relocating your family could still be appealing.